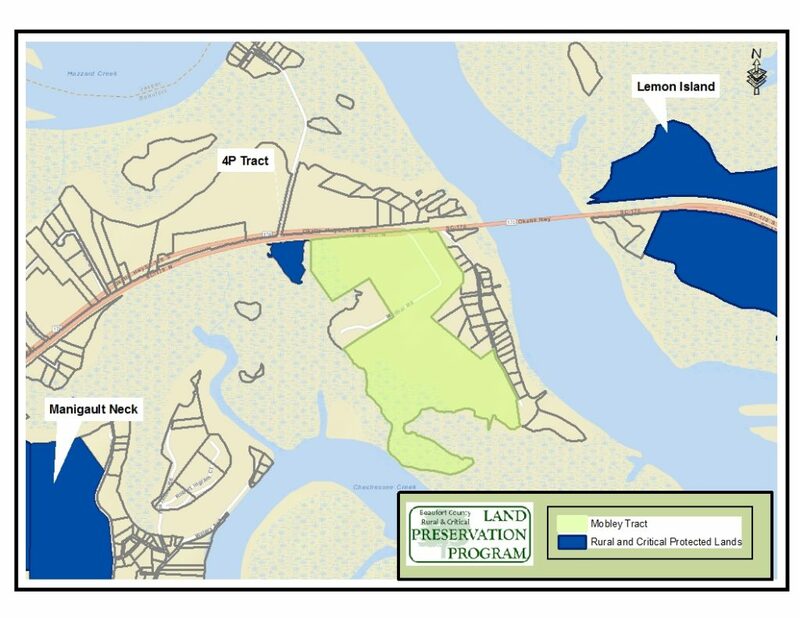 Recently, Beaufort County Council approved funds from the Rural and Critical Land Preservation Program (Program) for the purchase of two properties within the Port Royal Sound area and the Chechessee River watershed. The Port Royal Sound is a delicate embayment that is extremely sensitive to changes in the land, including development. The Mobley tract was annexed by the Town of Port Royal in 2006 and subsequently a Development Agreement was put in place which allows for 125 residential units. Funds from the Program will be used to purchase 95 acres of the property, located directly across from the Port Royal Sound Maritime Center. The Port Royal Sound Foundation (Foundation) and the Program will share in the cost of the purchase and the existing density will be removed, preventing future development. The Town of Port Royal is supportive of this purchase. The preservation of the Mobley tract will protect ecosystem health, water quality, habitat for marine organisms such as shellfish and oysters, and preserve the rural character and scenic quality of the surrounding area. “This partnership allows for the protection of the Sound and the opportunity for the Port Royal Sound Foundation to continue its mission of advancing the awareness of the unique Port Royal Sound system”, says Dean Moss, Chair of the Port Royal Sound Foundation. The use of the property will be managed through a Joint Use Agreement between Beaufort County and the Foundation and will provide opportunities for the Foundation to conduct ecological research and provide environmental education programs to the public. In addition, funding for the purchase of a 24-acre property known as the Jeter tract, on Highway 170 across from the area known as Manigault Neck, was approved. The permanent protection of this property will add to the existing mosaic of conservation lands. Six properties for a total of 725 acres in the Chechessee River watershed have been protected. Beaufort County continues to make an important investment in land protection within this focus area, culminating in a significant corridor of protected land, and the creation of a mid-county greenway. “The Sound and the Chechessee River watershed provide critical habitat for ecologically and economically important wildlife species, and the protection of key tracts that preserve the health of our local watersheds continues to be a focus of the Program,” says Lisa Lord, Rural and Critical Lands Program Administrator.